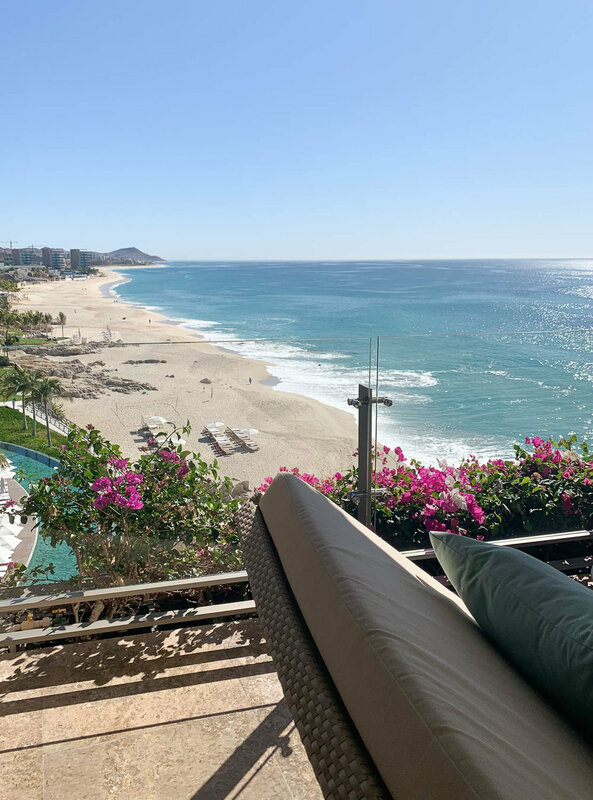 Looking for a resort in Los Cabos that includes everything but still has the luxury service and feel!? I found the spot for you! Let me begin by saying, I personally am not a big fan of all inclusive resorts due to the quality of food and service. 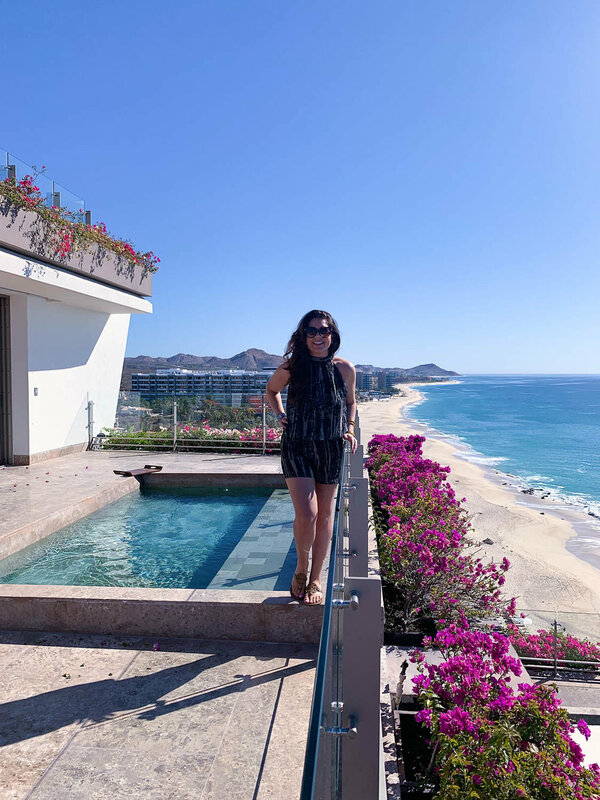 Typically, I don’t book them for my clients, but I have to admit, I was impressed by the Grand Velas Los Cabos all inclusive resort as a luxury option in Los Cabos. 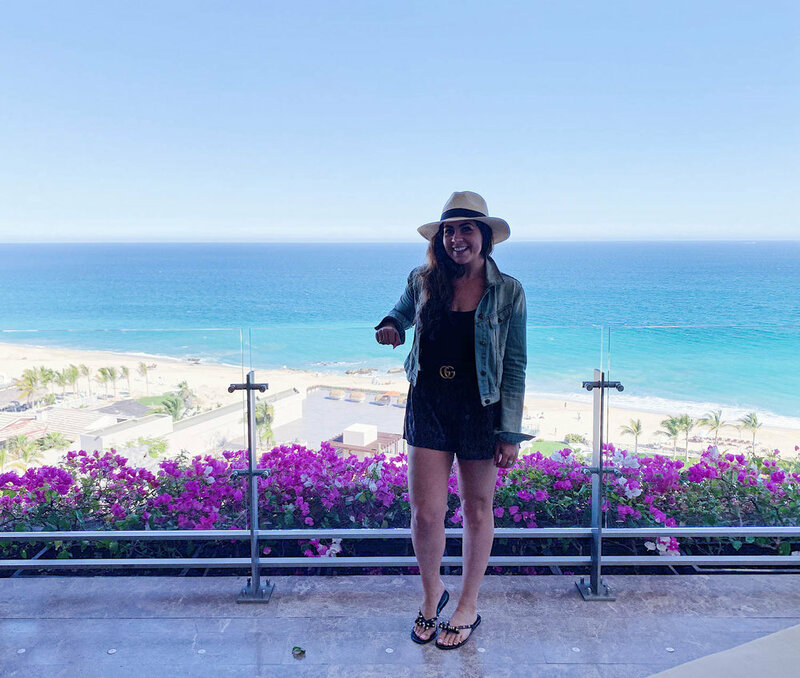 I got to experience 3 nights and I’m telling you why I would recommend it! This is a massive resort. Think Vegas style, but on the ocean… filled with color and plenty of pink flowers. There truly is no reason to leave the resort, because there is seemingly no end to the dining and activity options. With 304 suites, each with an ocean view, 1200sq ft or more, and a lounge area and patio. I absolutely loved the wellness rooms they offer, perfectly suited for health lovers. These come with a massage bed in your suite AND all healthy options for your amenities, including coconut water and a juicer! 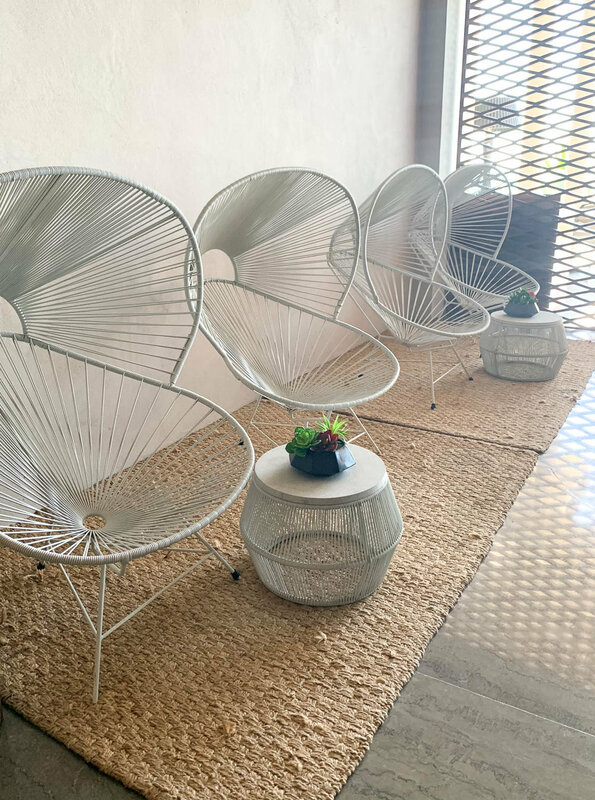 One of the main reasons people love All Inclusive Resorts so much is they love the convenience and perceived value of everything being one price and being able to not worry about any additional costs. 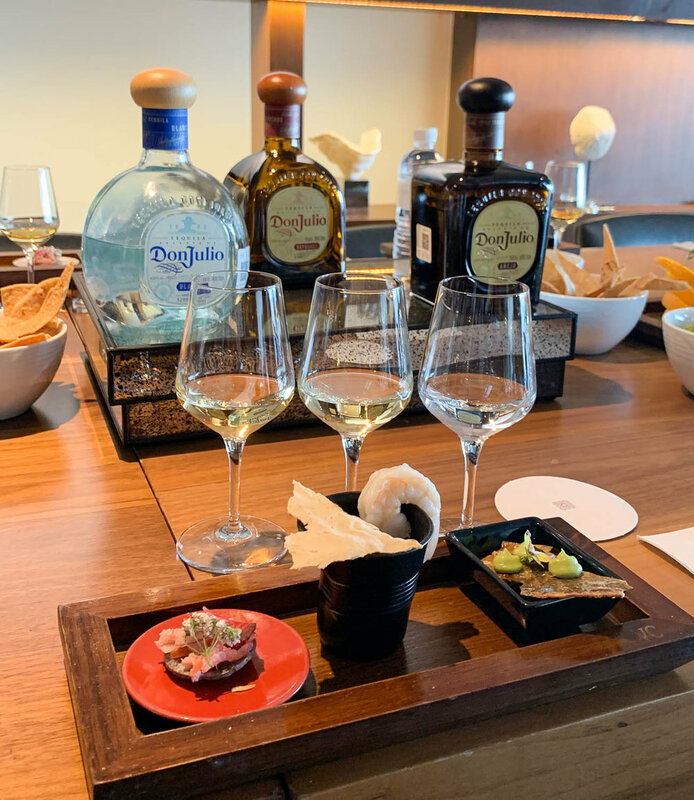 Usually, All Inclusive Resorts are known for the quality of the food being less than favorable but I was pleasantly surprised with their 7 restaurants and 24 hour room service options. They even have a restaurant, Cocina de Autor which is a 7 course menu by Chef Sidney Scutte who runs a two Michelin starred restaurant in Amsterdam. They have a fun and unique twist on the presentation and the experience with live music. In addition to the lovely private plunge pools available in some of the rooms, there are 3 pools on property. The pool closest to the ocean and beach is the adults only one. The pool staff is always available for pool side service so you won’t find yourself going very long without a drink. 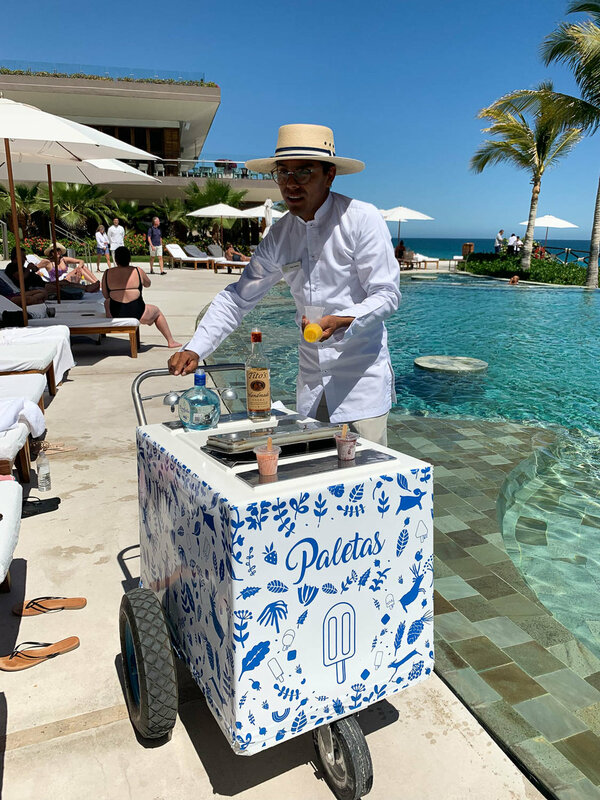 If you prefer heading to the poolside bar, there is 2 of them as well. If you prefer to hang on the beach, you can also get a cabana or beach chairs. Keep in mind, it’s not a swimmable beach, so you can dip your toes in the ocean, but don’t plan to do any water activities here. If you feel like you need a break from the sun and need some pampering, you can spend the whole day in their lovely spa. Here you’ll find 16 treatment rooms, a full hydrotherapy area, steam, sauna and cold ice room. I would absolutely recommend this resort for families, more than anyone. It’s an especially great place for young kids and teenagers since they have a full teen’s lounge. 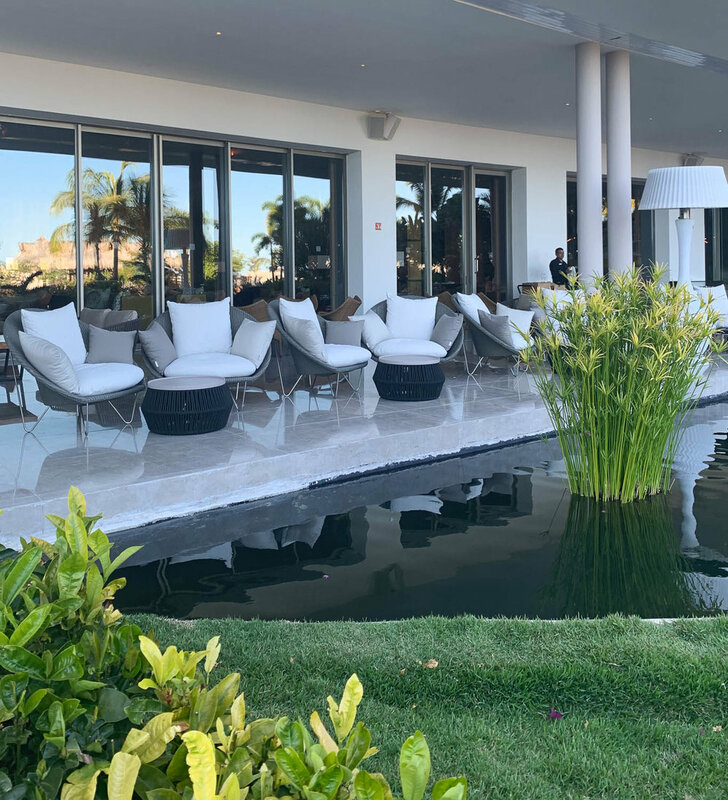 The Grand Velas Resort Group also has a property in Riviera Nayarit and Riviera Maya, but in my opinion, this is the nicest one because it’s the newest. Pro Tip: When booking your flights to Los Cabos, try to arrive by 9:30 a.m. to avoid long customs lines.